Dealing with bipolar disorder head on is not something taken lightly by anyone. That Bernie Mitchell (not a relative!) has not only taken the initiative in overcoming bipolar, but has shown that life can begin again once it has been dealt with, is a great tribute to the human spirit. I do not say these words lightly. 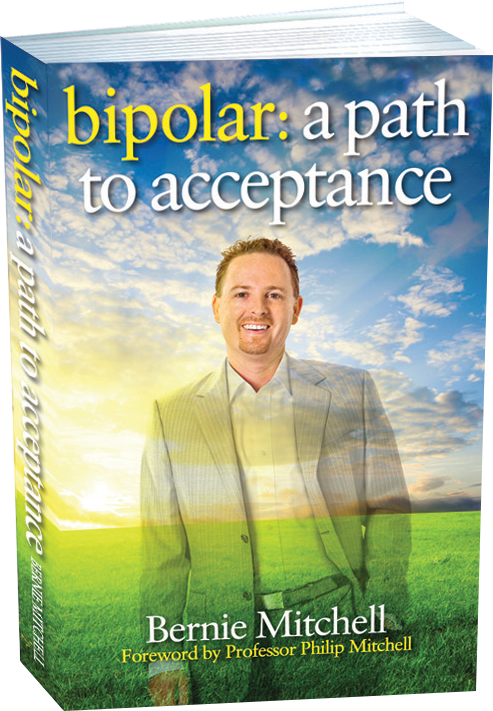 I have seen how bipolar can penetrate into the very essence of decent human beings, and render them helpless. I have also been dismayed by the heartlessness with which people with bipolar have been stigmatised; decent people I know who did not wish to have this terrible illness. There can be no doubt about it—what Bernie Mitchell has achieved takes immense, and almost incalculable courage. The demystification of bipolar is an area that many have attempted to tackle, not least a veritable army of researchers armed with data and charts. Bernie’s story is extraordinary precisely because it lets the rational, and the emotional meld together. What emerges is something much closer to the human element of truth than many researchers can ever hope to reach. In my own research I work hard to incorporate not just the dry formal stuff of science, and as a psychiatrist I am everyday faced with the human experience. Bernie’s story is therefore invaluable because it allows us all to enter into dialogue with his deepest thoughts, and to ride along with his insights. All too often people with mental illness are presented in our media, movies, and wider society as outcasts on the fringes. Here we see precisely the opposite: a bipolar sufferer winning at life, and surpassing the expectations that society had downplayed for him. This is a story of positive potentialities. Bernie has made a courageous first step in “coming out” with his bipolar—a hard thing to do for a successful businessman in a competitive male-dominated industry. I am certain others will too, and that in coming years we will see many positive stories mirroring his. Bernie’s risk will slowly turn the tables against the stigma of mental disorder that haunts our society. Throughout history stigma has been defeated by a slow shift in attitudes as people gain more and more information, and realise that the stigmatised are human (like us) too. Readers of this book will encounter, first and foremost, a human story. It is a story that requires nothing more than that one recognise the innermost human desire to be aligned with one’s values. These values are universal and immutable, and Bernie encompasses a broad range of them with seeming ease. This story will show you that this is not the case, and that his success was hard won. Finally I want to extend my congratulations to Bernie for being kind enough to donate 1,000 copies of this book to libraries throughout Australia. This is precisely the kind of gesture that I think distinguishes him. 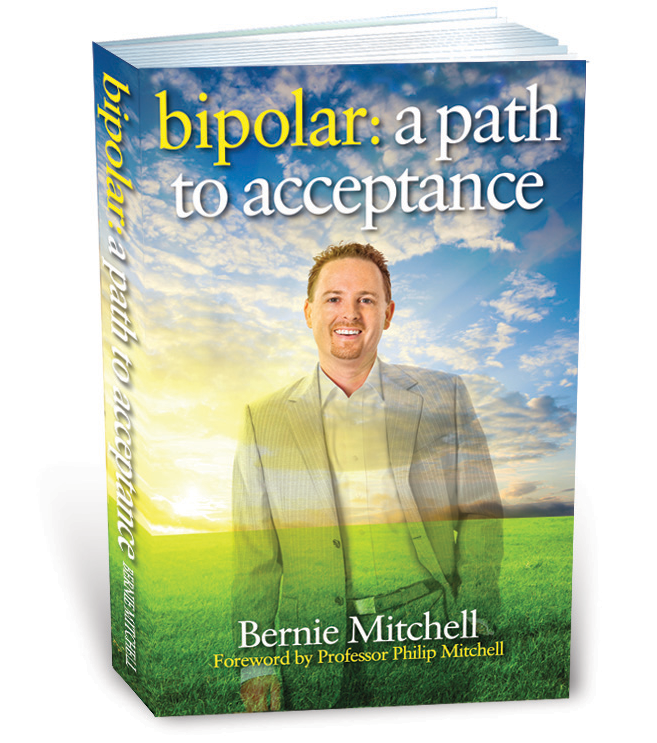 The book will, I strongly suspect, prove to be supremely useful for those currently suffering under the burden of bipolar. To them I cannot recommend the story of Bernie Mitchell enough. The enthusiasm spread throughout these pages is infectious, and could be the right impetus for setting your own overcoming of bipolar in motion. In these pages Bernie proves that life is a difficult but ultimately satisfying and meaningful process, and that the first step to an accommodation with it, is finding inspiration out there in the world. I suggest that you start here where a profound story of inspiration resides.